Elphaba: I'm the other daughter, Elphaba. I'm beautifully tragic. For those of you that don't know, Elphaba is the main character in the book (and Broadway musical that was based on the book) Wicked, by Gregory Maguire. It is the telling of the life of the one most people know as the Wicked Witch of the West from The Wizard of Oz. 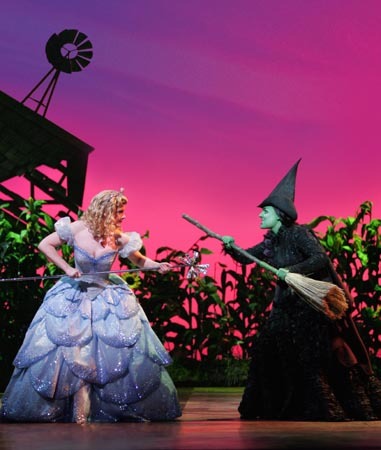 Glinda: [pointing to Elphaba's broom] You're not still carrying that old thing around?! Elphaba: Well, we can't all come and go by bubble! I love that it's a captivating tale from a perspective that others wouldn't have even thought to tell and of what she endured in life and the friendships she made along the way. Elphaba: What is it? What-do I have something in my teeth? Okay, lets just get this over with: No I'm not seasick, Yes I've always been green, and no I didn't chew grass as a child. 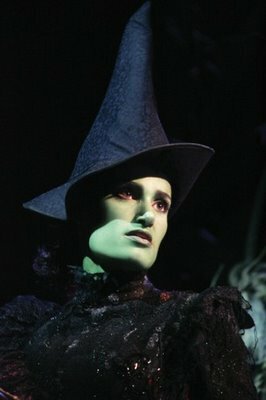 Elphaba: [in response to Dorothy's crying] Oh, for Oz's sake, stop crying! I can't listen to it anymore! You want to see your Aunt Em and your Uncle what's his name again? Get those shoes off your feet, Little brat! Who takes a dead woman's shoes, must have been raised in a barn! I raved about the musical so much (and highly recommended the book...I actually really liked it), that I got Misha addicted to both. 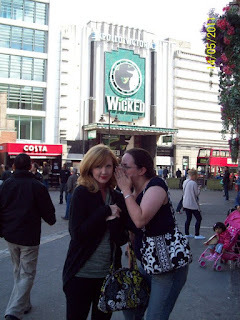 As in, she liked it so much, that when we went and saw it in London, if we would have had the money, we'd have gone and seen the show a second time that same night! 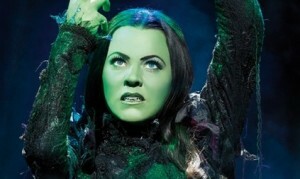 In other news...look out for Halloween...we're planning on Misha dressing up as Elphaba and myself as Galinda!! !